The Eyes Galaxies are one of the best-known interacting galaxies in the sky, along with the nearby Siamese Twins, the Whirlpool Galaxy (Messier 51) in Canes Venatici, Mice Galaxies in Coma Berenices, Antennae Galaxies in Corvus, and NGC 2207 and IC 2163 in Canis Major. NGC 4435 is a compact barred lenticular galaxy that appears to be almost devoid of dust and gas. The galaxy contains a young population of stars on its central regions. Discovered by the Spitzer Space Telescope, the stars have an estimated age of 190 million years and may have formed as a result of the galaxy’s interaction with the neighbouring NGC 4438. NGC 4435 features a long tidal tail that may also have been caused by the collision, but some studies suggest that the tail is in fact a cirrus in the Milky Way, completely unrelated to NGC 4435. The galaxy’s bright core covers more than 50% of its diameter. 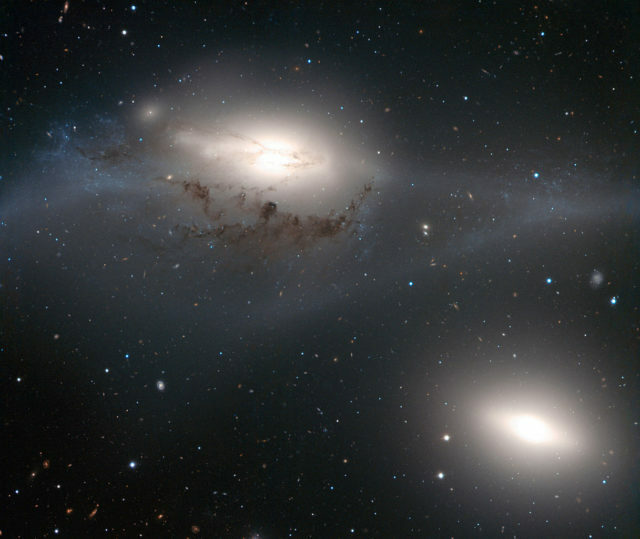 NGC 4438 has long tidal tails and a very distorted disk, which has led to scientists classifying it either as a spiral or lenticular galaxy. The galaxy was likely once a spiral galaxy, but encounters with its neighbours over the last few hundred million years have left it damaged and badly deformed. NGC 4438 has an obscuring lane of dust just below its nucleus and young stars can be seen to the left of its centre. The galaxy is exhibiting effects of ram-pressure stripping caused by the interaction with NGC 4435. It shows a displacement of atomic and molecular hydrogen, interstellar dust and hot gas in the direction of the other galaxy. Scientists believe that this may have been caused by an encounter with NGC 4435 that happened millions of years ago. 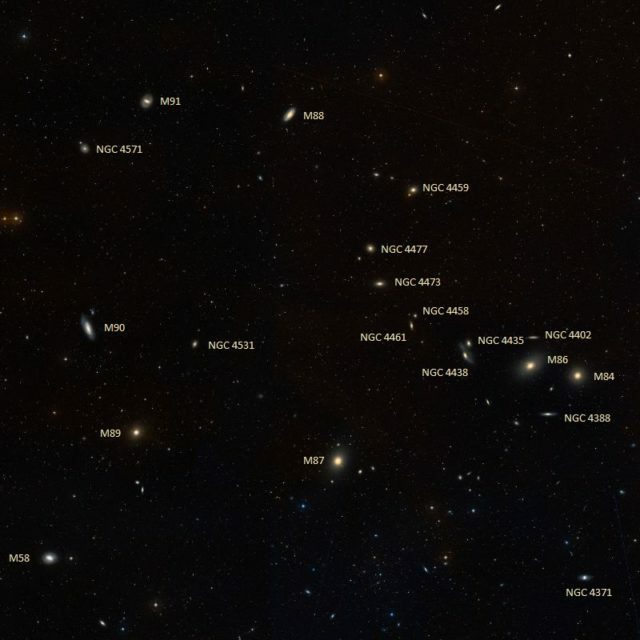 There is also evidence of a possible interaction between NGC 4438 and larger neighbor Messier 86, as several filaments of ionized gas were discovered that link the two galaxies. NGC 4435 and NGC 4438 are about 100,000 light years apart. 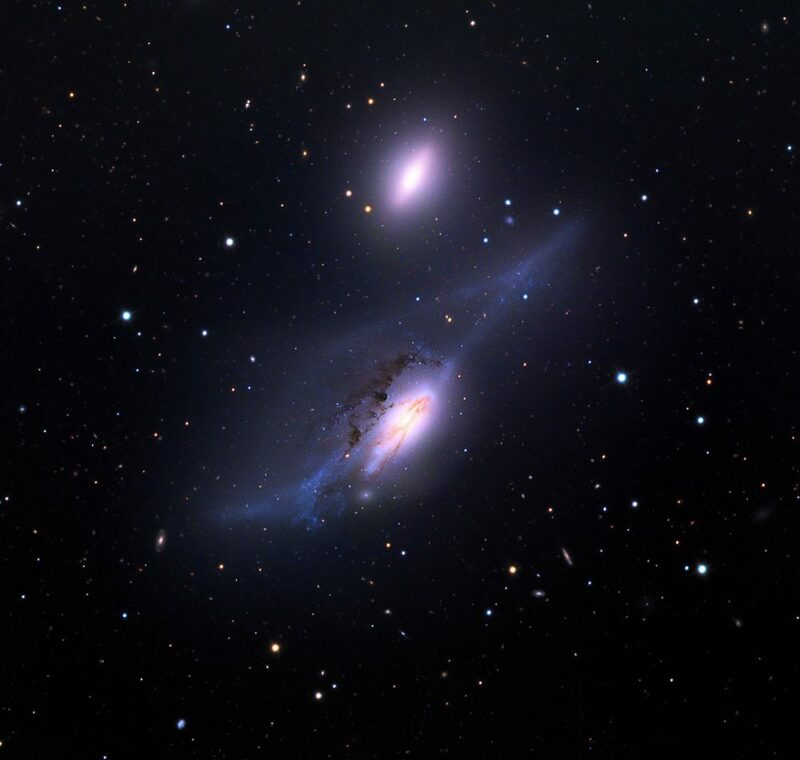 They are believed to have come within about 16,000 light years of each other some 100 million years ago, which resulted in gravitational tides from the encounter ripping away material – stars, gas and dust – from NGC 4438 and removing most of the dust and gas from NGC 4435 and reducing its mass in the process. The bigger NGC 4438 was able to hold on to a good portion of the material torn out in the encounter, while much of the material from NGC 4435 was lost. 19th century observer L. S. Copeland named the pair the Eyes Galaxies. In medium-sized telescopes, the galaxies’ bright oval cores look like a pair of eyes glowing in the dark. 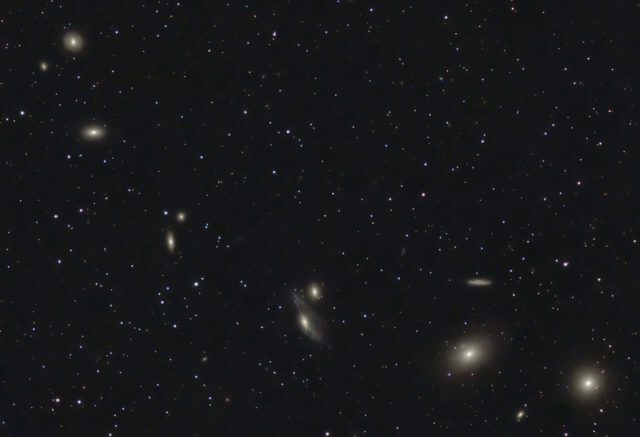 Sometimes also known as Markarian’s Eyes, the interacting galaxies are part of Markarian’s Chain, a string of galaxies that lie along a curved line in the centre of the Virgo Cluster. Markarian galaxies also include Messier 84, Messier 86, NGC 4477, NGC 4437, NGC 4461, and NGC 4458.